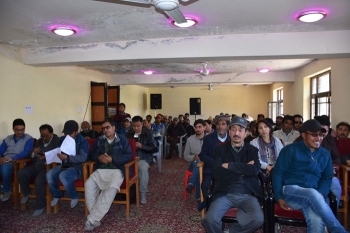 A district-level multilingual mushaira session for two days was organised by Jammu and Kashmir Academy of Art, Culture and Languages, Kargil on April 25 at Language Centre, Kargil. On an inaugural day, around 25 young and old poets across the district recited their poetic renderings in Urdu, Balti, Purgi and Shina/Dardi languages. Underlining the importance of language and vernacular expressions as intrinsic components determine the identity of a community or race, Kacho Ahmad Ali Khan, CEC said it is the responsibility of parents and teachers to ensure knowledge and information about mother tongue imparted among the young generation. He said the need is to use mother tongue in everyday conversations and intellectual discourses at home and school. The revival of the 'Ee Gay' script was also stressed upon and informed that Hill Council is committed to the promotion and preservation of culture. He also assured all support to the Academy. Kacho Ahmad Ali Khan said such event would facilitate a platform for the interaction among intellectuals and boost to the art of poetry in vernacular languages. Barkat Ali Lone Nizami, Assistant Commissioner Development Kargil, officers from the civil and police administration, writers, poets, intellectuals, students and many literary enthusiasts were present on the occasion. Around 60 poets across the district took part in the poetic sessions based on the onset of spring and other related themes.